The Energy Company Obligation (ECO) is a government energy efficiency scheme in Great Britain helping reduce carbon emissions and tackle fuel poverty. The Church of England launched its 'Shrinking the Footprint' campaign in the summer of 2006 to enable the whole Church to address the issue of climate change. The campaign first encouraged all dioceses and parishes to produce an ‘energy audit.’ All 16,000 churches were asked to record their energy use and to find ways of reducing it, prior to a survey in 2008. Churches may not be major users of energy, but they can be an example to their congregations and to the community. "Live more simply so that others may simply live"
We thank God for the good things in our world, but we should also consider the impact mankind has on the environment and what we are going to do about it. With this in mind, an Eco Group was set up at St James's in 2007 to encourage and co-ordinate environmental awareness in our parish life, both as a congregation and as individuals in our homes. Part of this church's approach from its very foundation has been to look outwards. Why? God sent his Son because he so loved the world. This is in the spirit of our first vicar who expressed love for the world in his social action as well as his preaching. One example of growing towards the world is considering our responsibility for the environment in seeking a 'Green supplier' of electricity. The Parochial Church Council honoured its commitment to switch to a renewable energy supply in 2011. This was in keeping with one of the themes of the 2010-13 Mission Action Plan - 'Growing towards the world'. With advice from the Eco Group St James's electricity is now provided by LoCo2, a family-run British renewable energy and low-carbon electricity supplier, who produce electricity through a number of renewable technologies including wind, hydro and solar. "LoCO2 Energy is an independent, family-run British renewable energy and low-carbon electricity supplier. They are a young company with a fresh approach to providing electricity who believe energy should be green, cheap and delivered with prompt and cheerful customer service. Not only this but, through their sister business TLS Hydro, they own and operate their own hydropower stations throughout the UK." • Installing a new heating system to use our renewable energy more efficiently and to save wasting energy (new boiler shown below). • Changing the majority of the light bulbs to low energy in the church and the church hall. In 2009 the twenty four lamps in the nave ceiling were replaced by fluorescent lamps using less than 20% of the power of the incandescent ones. As well as saving power, the cooler-running new lamps should help prevent further blackening of the ceiling. • Monitoring the use of gas and electricity - a monthly table is kept and studied. 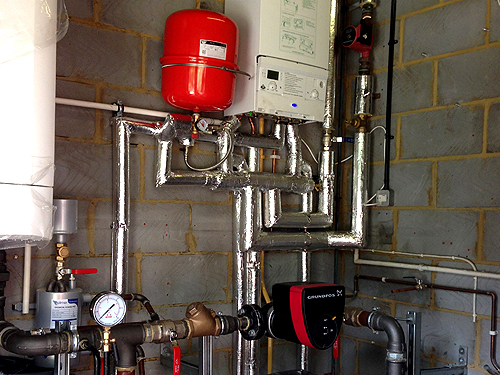 • Monitoring church hall heating during the Christmas, Easter and summer holidays. • Improving the signage on the light switches in the church hall. • Putting up notices encouraging people to turn off lights. • Putting 'Green Tips' in Spire Magazine to encourage people to reduce their energy use. 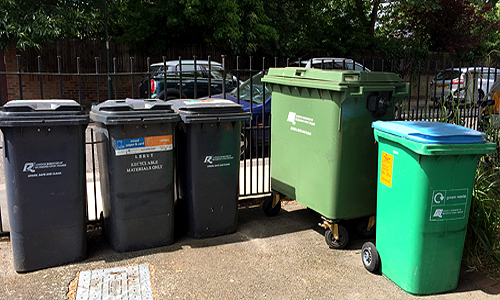 • Recycling paper, cardboard and plastic bottles in bins provided by the council in the church. car-park. They are used by the parish office, the nursery school and hall users. • Putting water-saving devices in the toilet cisterns. • Holding car-free Sundays to encourage people to walk, cycle or car share when coming to church. • Continuing the monthly Traidcraft stall which stocks many foodstuffs and a selection of craft items. Many more items are available from Traidcraft and catalogues in church enable parishioners to order products from Catherine or Ann, who can give a discount of 15% on craft and clothing items.